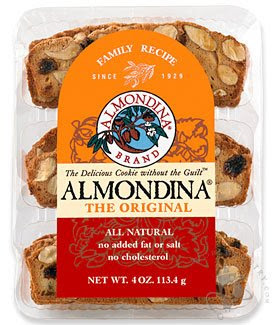 I recently found these delicious little all natural cookies at Whole Foods called Almondina. My flavor of choice is called "The Original," which is made with almonds and raisins, and has no dairy, added fat, salt or cholesterol. The cookies also come in other flavors like pistachios with almonds, as well as chocolate with almonds. Each cookie is very very thinly sliced and super crunchy. They actually remind me of a cross between an almond muffin, a biscotti (but thinner, with less calories), and a crunchy "bready" crouton (one of the many foods I love but usually try to avoid). Nutritionally speaking, 3 of the cookies are 100 calories, 3 grams of fat, and 0 grams of fiber (this is slightly less than one serving as listed on the package which is 4 cookies), or 2 weight watchers points. I decided my favorite way to eat the cookies is individually on their own, but you could consider crumpling one up into your ice cream, your low calorie egg nog (why I originally bought them! ), spreading cheese across them, or dipping one into herbal tea which would also be absolutely delicious! I found these little cookies at Whole Foods hidden at the bottom of one shelf in the cookie aisle. They can also be found at some Trader Joe's as well as various other stores. Ohhh.... these looks really good. Now that it's hot chocolate season, these nutty cookies will pair nicely. Thanks Juliet. thee cookies look more like biscotti, right??? which is my favorite sweet snack! Oooh, those look yummy! I'll have to get some on my next shopping trip! Oooh, very cool!! I immediately thought of biscotti also. They look great, nice find! juliet, these are on my grandma's kitchen table every time i go over her ouse. i used to dip them in my coffee when i drank coffee. i had to stop because of some dreaded acid problems. ps- you won an award on my blog!! check it out. Cookies plus low fat? Perfect! Yayyyy for your guest post- you rock! These cookies sound awesome! I'd love to crumble on in yogurt! I've tried these - got them at Trader Joe's. They are really good!! Just found your blog - I really like it!!! Will be back to visit =) Oh and I am from the bay area too! Trader Joe's has the best price around for Almondinas.